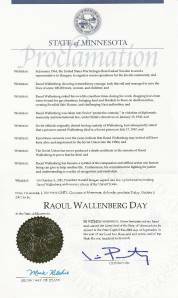 New York City, NY – October 4, 2007 – In honor of the bravery, heroism and courage of Raoul Wallenberg, Governor Tim Palwenty of Minnesota has officially declared October 5, 2007 as Raoul Wallenberg Day in the state of Minnesota. The official proclamation, as suggested by the International Raoul Wallenberg Foundation (IRWF), declares that Wallenberg ”has become a symbol of the compassion and selfless action one human being can give to help another life” and that ”his commitment to fighting for justice and understanding is worthy of recognition and emulation.” This is the first time that Raoul Wallenberg Day has been declared by the state of Minnesota since 1999. Raoul Wallenberg was a Swedish diplomat sent to Hungary in June 1944. During just a six-month stay in Budapest, he rescued more than 100,000 Jews. Wallenberg was never seen again in the free world after January 17, 1945, when the Soviets imprisoned him. The International Raoul Wallenberg Foundation (IRWF) is a non-governmental organization with the mission to develop educational programs and public awareness campaigns based on the values of solidarity and civic courage, the ethical cornerstones of the Saviors of the Holocaust. The IRWF initiated the proclamation of ”Wallenberg Days” in U.S. states on October 5th; the day Wallenberg was awarded Honorary U.S. Citizenship by President Reagan in 1981.